So dairy free milk doesn’t have to contain nuts. There are plenty of options that can all be created at home including rice, oat or hemp milk. Similar to nut milks that are shop bought, they can contain lots of emulsifiers and sweeteners so making your own really is the best option. 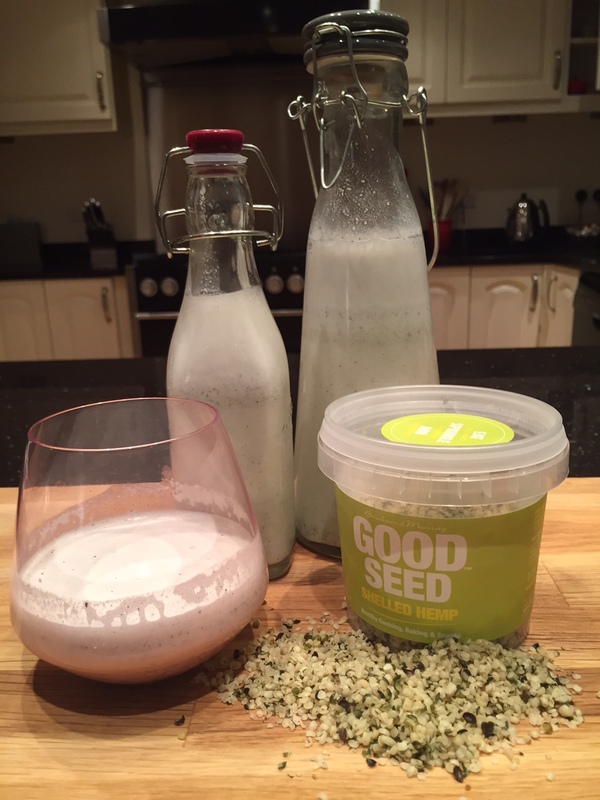 So today I am going to look at hemp milk, which is made from the seeds of the hemp plant. As many know this is part of the cannabis sativa family and I first wanted to highlight the differences between hemp and marijuana, as I am definitely not recommending this drink for people to get high! The main difference is the THC content, which is one of the most well known cannabinoids in cannabis. THC is credited with causing the marijuana high and hemp seeds actually contain a minimal amount of this psychoactive chemical. Most countries have the THC maximum level set at 0.3% for hemp. Additionally it is high in a compound called CBD, which actually reduces the effects of THC. Hemp seeds are nutritional powerhouses, with each seed containing approximately 44% oil, 33% protein and 12% fiber. They are packed with micronutrients, vitamins, minerals and phytosterols. 2- Strain through a muslin bag or fine sieve. You don’t have to do this and gives a fuller texture with the fiber of the hemp seeds. Health benefits of Hemp: Hemp seeds are a great source of all the good fats that we need in our diet including omega 3 and 6. These are found in a better ratio in hemp seeds in comparison to other oils at 1:3. In addition to these fats it also contains Gamma Linoleic Acid (GLA) and stearidonic acid (SDA). These are considered “super” polyunsaturated fatty acids and have been shown to relieve symptoms of certain skin diseases including dermatitis. In addition to these fats, it contains all known proteins and is high in many vitamins and minerals including Vitamins A, E, B12, folic acid, magnesium, potassium, calcium, iron and magnesium. So we can see that this really is a food having in the diet and warrants the “nutritional powerhouse” label.